Democracy is in dire trouble when voters in a state have only one in ten state legislative districts that are even remotely competitive in a general election. Wisconsin was such a state in 2014. CC/WI conducted an analysis of last Fall's general election results, identifying the State Senate and State Assembly districts in which voters had a real choice that wasn't already preordained by the 2011 redistricting process. Legislation to end hyper-partisan gerrymandering, Senate Bill 58, was introduced earlier this year. To see a list of the current co-sponsors of this legislation go here. If your State Senator and/or State Representative are not yet co-sponsors and supportive of non-partisan redistricting reform please contact them and tell them to co-sponsor and support Senate Bill 58. If you are not sure who your State Senator or State Representative is, go here (type in your home address under "Find My Legislators"). Finally, you can be among the first Wisconsinites to sign this on-line petition in support of non-partisan redistricting reform. We need to demonstrate that many citizens in this state want elections in which voters choose their representatives, not the inverse – which is what we have now in this state. Please urge your friends and family to sign the petition as well. 1. Starkly contrasting visions about what state campaign finance laws should look like. Supreme Court is part of a larger partisan plan. majority of state supreme court justices who are beneficiaries of support from WCG. 4. Scott Walker's shifting views on campaign finance reform (from very bad to worse). 5. Needed: The Constitutional right to vote. 1. One thing that everyone in Wisconsin can agree on is that our campaign finance laws are seriously outdated and need major revision. But there are stark differences of opinion about what campaign finance law ought to look like. 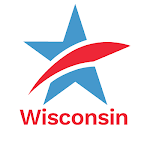 Late last month, CC/WI Director Jay Heck was invited to appear before the combined State Senate and Assembly committees with jurisdiction over campaign finance law in order to tell legislators what CC/WI thinks ought to be included in a rewrite of state campaign finance law. Jay's testimony is here. You can also see the entire hearing on Wisconsin Eye (Jay's testimony begins at 01:38:54) and read the Associated Press article about the hearing here. Bill Lueders of the Wisconsin Center for Investigative Journalism wrote this excellent article about the hearings, which appeared in many newspapers around the state in recent weeks. What the new campaign finance law will look like is not yet known, but when it is ready, it will likely be quickly unveiled and then rammed through the Legislature – which is increasingly how the majority party in the Legislature "gets things done," when they want to get something quickly behind them. Stay tuned for that. 2. 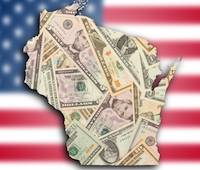 On April 7th, Wisconsin voters re-elected Ann Walsh Bradley to the Wisconsin Supreme Court in one of the less expensive elections for a seat on the high court in recent years. Big outside money largely stayed out of the Bradley contest with Rock County Circuit Judge James Daley. Instead, most of it, including more than half a million dollars from Wisconsin Manufacturers & Commerce (WMC), went to pass a constitutional amendment to change the way the Chief Justice of the Wisconsin State Supreme Court is selected, primarily to demote current Chief Justice Shirley Abrahamson. 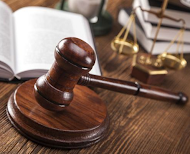 The amendment passed fairly narrowly and it is part of a much broader partisan political agenda that has been playing out over the last four years on a wide array of issues. 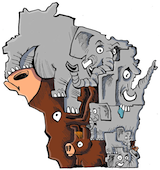 Mary Bottari, of the Center for Media and Democracy, wrote this excellent analysis of this ongoing partisan plan to dominate Wisconsin politics, with plenty of input from CC/WI. 3. On April 17th, the Wisconsin Supreme Court will begin to consider whether or not the "John Doe II" investigation of possible illegal campaign coordination between Governor Scott Walker's campaign and WCG and WMC during the 2012 recall election, ought to continue or not. There will be no oral arguments in open court, which is highly unusual. The case is further complicated by the fact that four of the seven justices were the beneficiaries of hundreds of thousands of dollars of outside spending by WCG and WMC. Recently, Jay Heck spent an hour on The Kathleen Dunn program on Wisconsin Public Radio's Ideas Network to talk about and explain what the John Doe investigation is all about, and to discuss money in politics in general. 4. When Scott Walker was first elected to the Wisconsin Assembly in 1993, one of the first committees he chaired was the Campaigns & Elections Committee, with jurisdiction over campaign finance law. Back in that era, Walker proposed and backed some measures that would not be viable today because of more recent court decisions and also because he has moved even further to the right and now opposes disclosure, for example. Walker has been consistent in always backing and pushing campaign finance measures that provided his political party a partisan advantage and/or weakened the Democrats. He has never been a supporter of meaningful bipartisan campaign finance reform – the only kind that really matters. Earlier this week, the Milwaukee Journal Sentinel published this article about Walker's campaign finance views then and now, which includes Jay Heck's observations. Jay also appeared on The Devil's Advocates radio program on Monday to talk about Walker's shifting positions on this issue. 5. Do you have a constitutional right to vote? Most Americans probably think that they do (or should). But the right to vote is not explicitly stated anywhere in the U.S. Constitution and many citizens (including us) think it needs to be. Wisconsin U.S. Congressman Mark Pocan (D-Madison) has introduced a constitutional amendment that would accomplish this and here are the details. The State Governing Board of Common Cause in Wisconsin (CC/WI) voted unanimously Wednesday to urge Wisconsin citizens to vote against the constitutional amendment question on the April 7th ballot that would change the way in which the Chief Justice of the Wisconsin Supreme Court is selected. “This measure is clearly directed at one individual – the current Chief Justice – and as such we believe it is overtly personal and partisan and ought not be the basis for a fundamental change in the Wisconsin Constitution,” said Bill Kraus, the Chair of CC/WI. Jay Heck discusses Walker’s campaign finance beliefs, past and present.